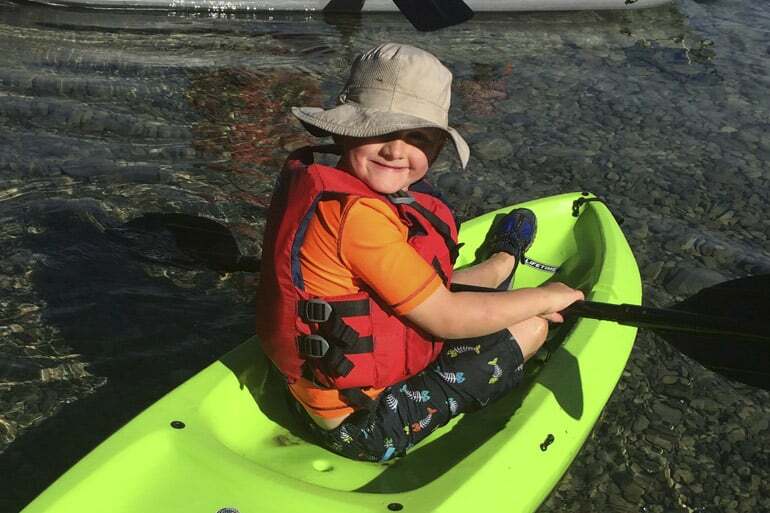 When people think about taking kids camping, their biggest concern is almost always how are people going to sleep (and WILL sleep actually happen). 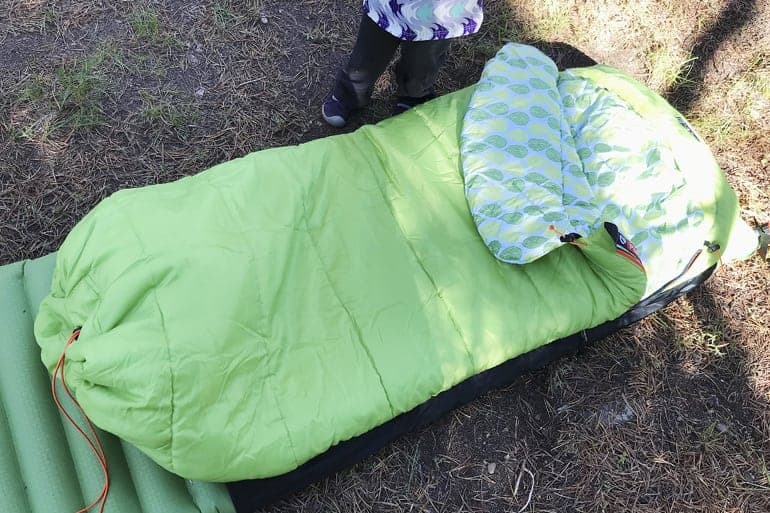 And with good reason – it’s hard for kids to do change sometimes…and even more so when they’re suddenly in a sleeping bag instead of a bed. 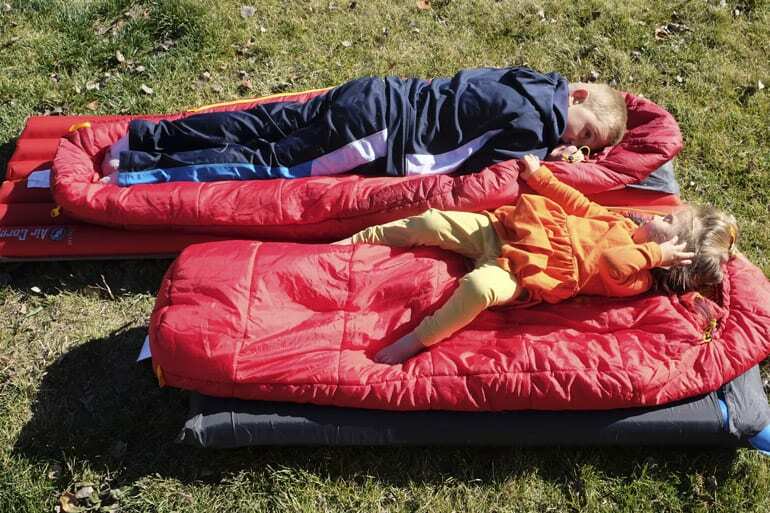 Back in 2012, we wrote a post about WHY kid-specific sleeping bags are worth it. Because, yes, we do think they are. We also reviewed a few that we could round up and shared what we thought were the best for different sleeping situations. Be sure to check that out before going on. 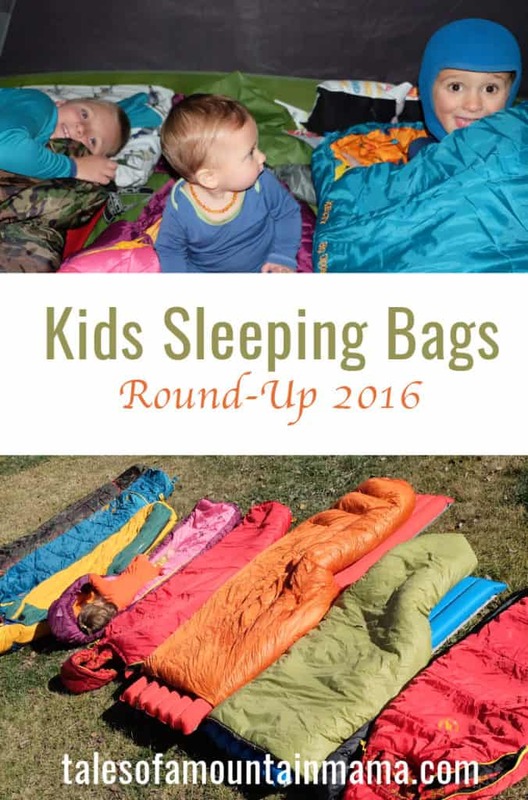 We’ve added a couple more kids and done a ton more nights in sleeping bags since then. 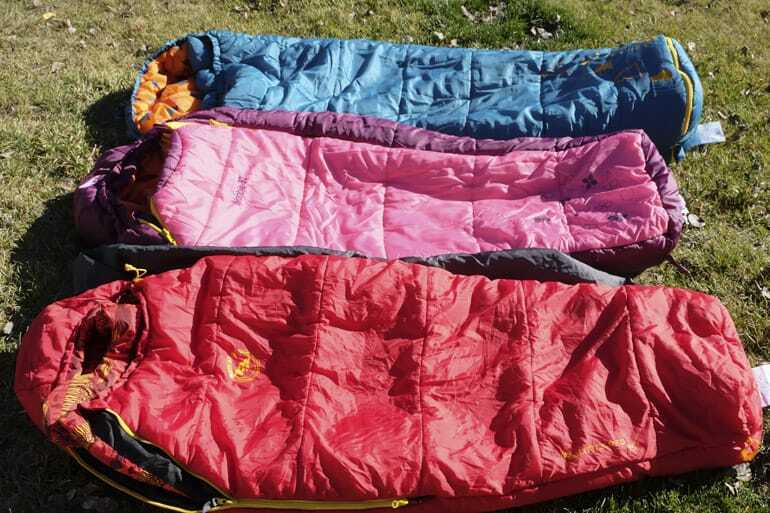 Some of the sleeping bags we reviewed are actually not even available in the U.S. anymore (like, sadly, the Deuter ones). There are also quite a few new ones that we think are pretty great and worth checking out. We are also going to do our best to continually keep this post up to date (new ones added for 2018!). 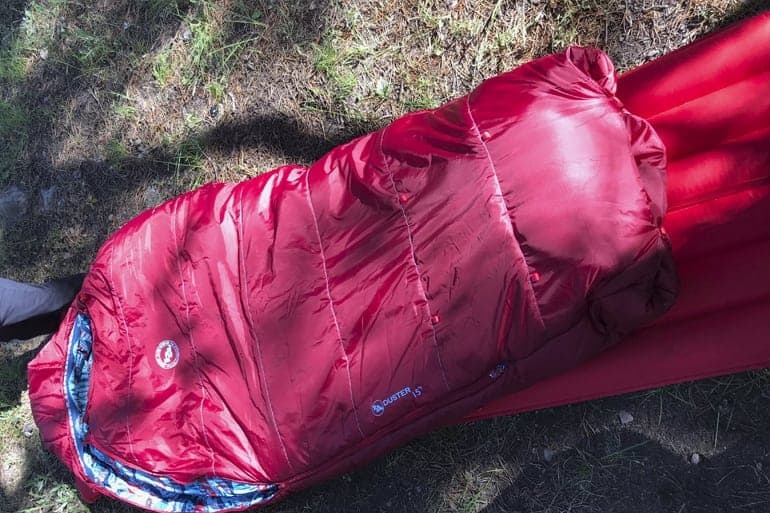 We know right now is not exactly camping season….but sleeping bags make really great gifts too! Finally, you’ll notice that our focus here is on more serious camping. These aren’t go-on-a-sleepover bags that you would use indoors. 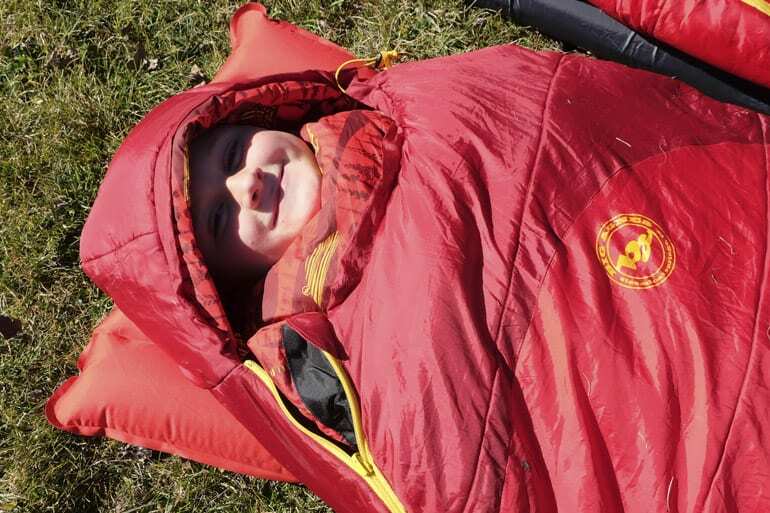 They’re not meant to be cutsey, but rather keep your kids warm and happy while camping. 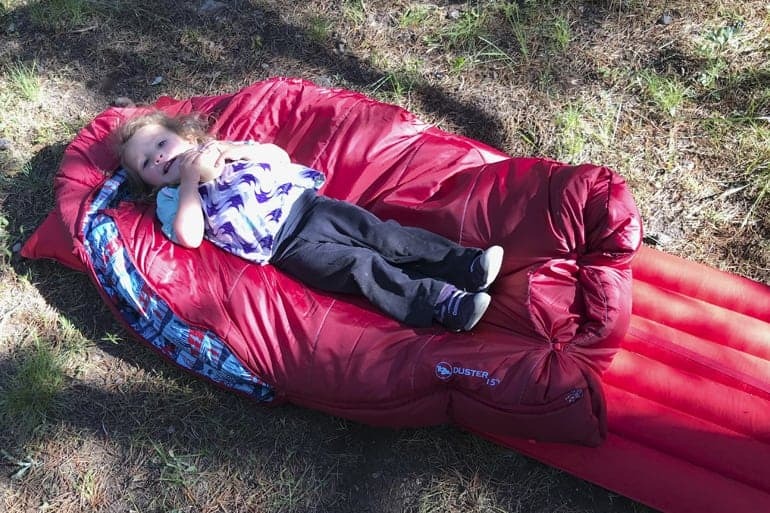 While most of us think of only using sleeping bags for the kids while camping, there are other options. 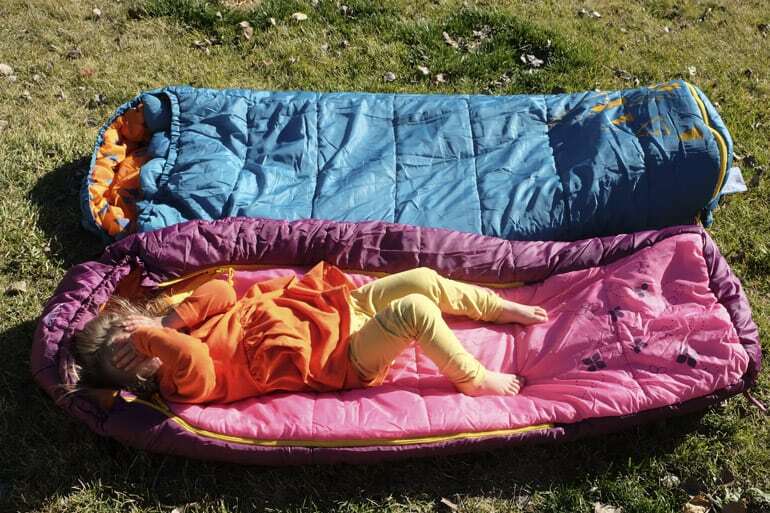 Backcountry quilts are basically down (or synthetic) quilts that are kid-size (or adult if you go that avenue..but we are just talking about kids here!) They are our top choice for backpacking because they are so small and light. 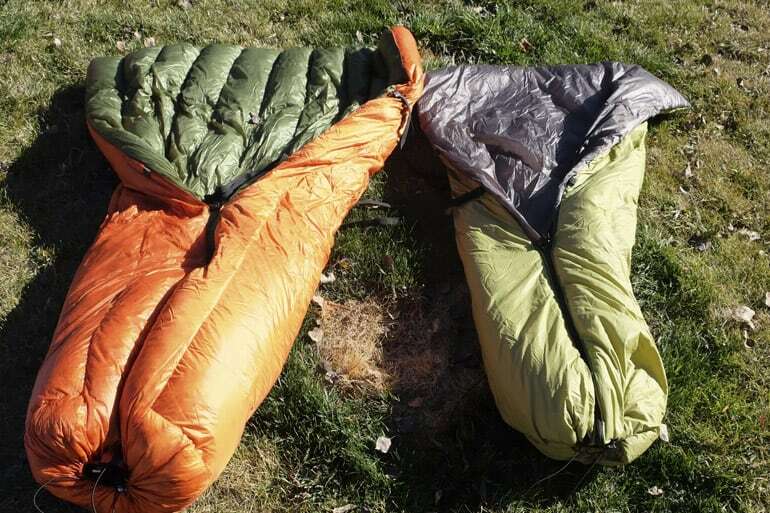 BUT, you’ll end up spending more than other sleeping bags. You’ll notice that both of these above (from Enlightened Equipment) can be used flat like a quilt, or the toe box can be zipped like below (perfect as you adjust for different temperatures). With the quilts, you are sleeping directly on your pad. This allows more warmth with less fabric/material. 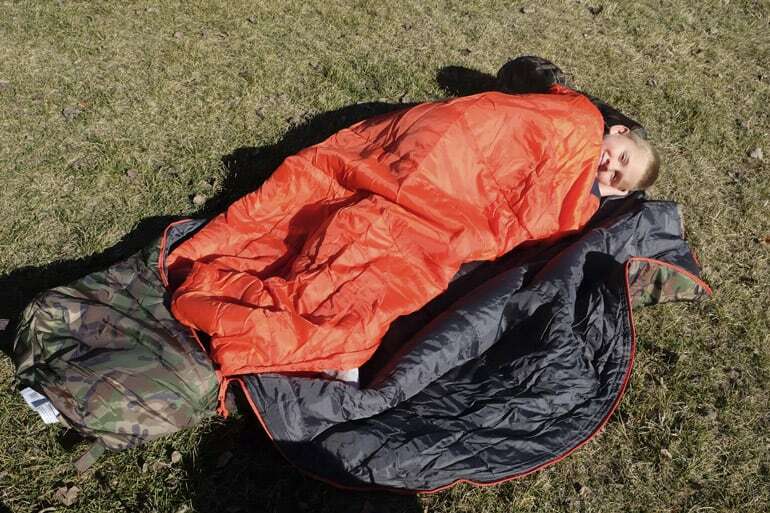 Remember that when you’re in a sleeping bag, the material under you is compressed and really does almost nothing for warmth (which is why sleeping pads are so essential). Kids that are really sensitive to how things feel may not love this, but our kids are usually just in long underwear anyway so they don’t even notice. 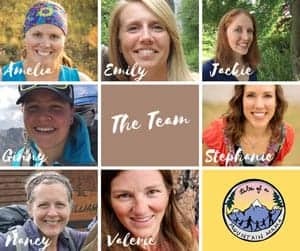 We have used and loved the Protege (on the left right in the photos above) from Enlightened Equipment. It is the more budget-friendly synthetic option. We also have a Revelation Junior (on the left in the photos above), which is a lot more expensive (because it is treated down), but is very warm and larger. Enlightened Equipment quilts are made to order, which means they take a little longer to get to you, BUT you can also decide how warm you want your quilt to be! Since we live in the mountains and nights are almost always cold, we opted for the colder settings. Note that the Revelation can be built to a colder rating than the Protege. Our Revelation is a 10 degree quilt and the Enigma a 20 degree quilt. The quilts come with straps so you can attach them directly to your pad to avoid rolling off and losing your warmth. They can also be cinched at the toe box and around the head. 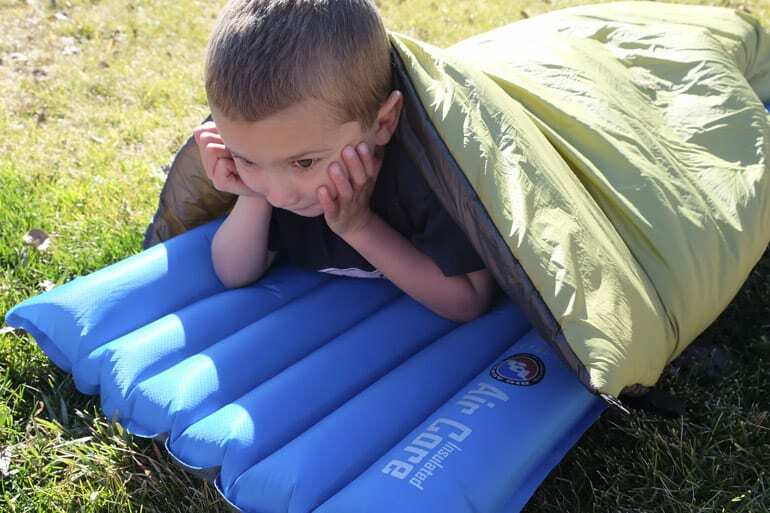 Some, like the ones from Enlightened Equipment, have built-in straps that keep kids on their sleeping pads <–this is HUGE! Also definitely check out the review by The Kid Project. They have a great video that shows how these quilts work and how they keep kids on their sleeping pads. 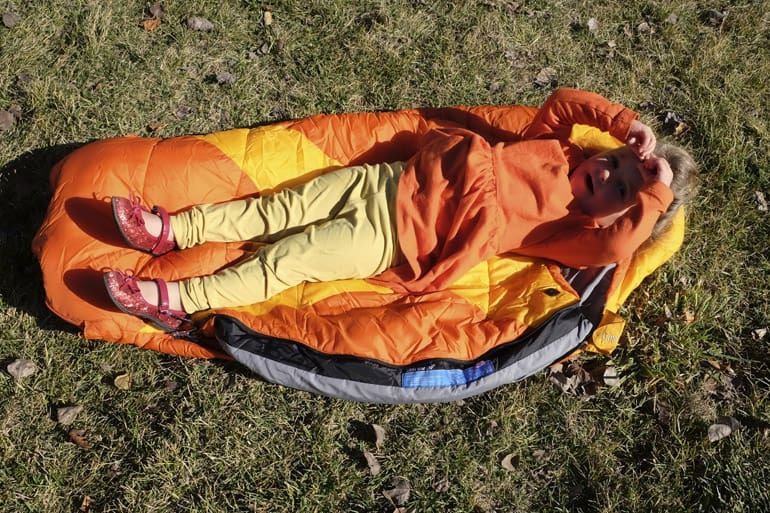 Someone correct me if I am wrong, but the only company that I know that makes a kid sleeping bag with a pad sleeve is Big Agnes. UPDATE: Nemo Equipment now makes one too (see below in the “adjustable bag” section). 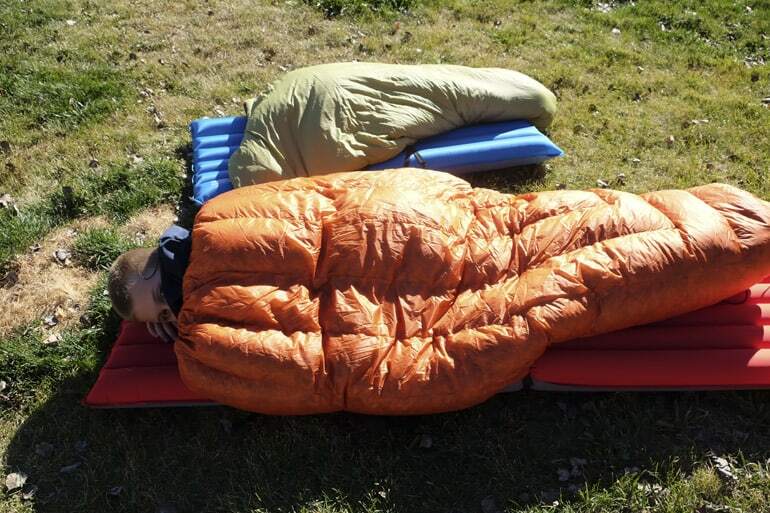 Sleeping pads are key to keeping warm while camping. When you roll off of them (or spin or nudge or whatever your kids do), you lose a ton of warmth. Big Agnes & the Nemo Punk bags have an integrated sleeve that keeps your bag and your pad attached. So, the only way you are going to be separated from your pad is by completely ditching the whole system. Big Agnes just updated their kids’ bags and now have Little Red 15 and Wolverine 15 (see added new one for 2018 below). They’re both synthetic, both have pad sleeves and both keep kids really warm. We also like the “neck pillow” to trap warm air in the bag (see second photo below). They used to have integrated sleeves you could stuff with clothing for a pillow, but did away with those for their kids bags. 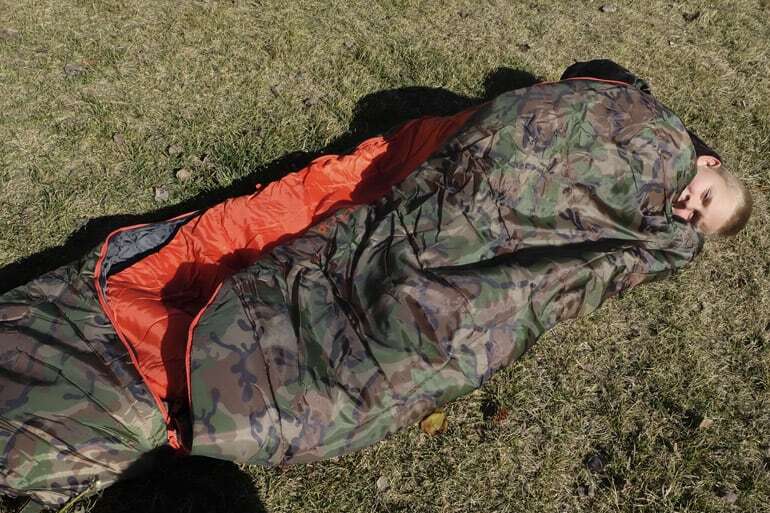 For most campers camping in colder temperatures, these are perfect. 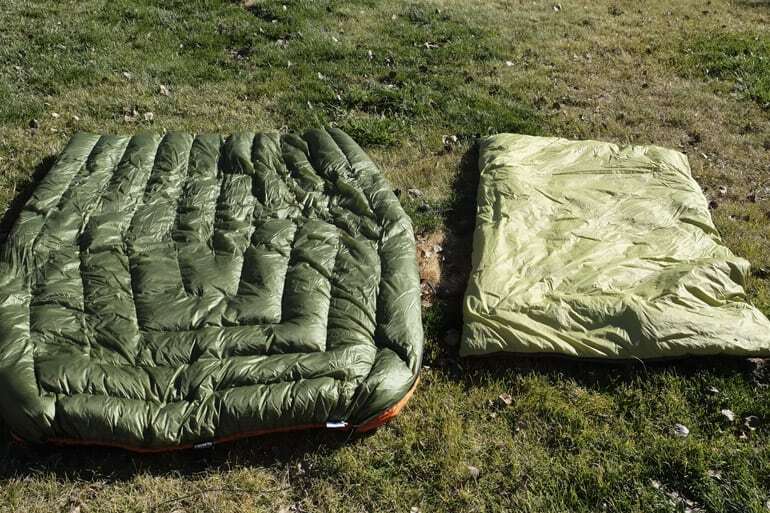 However, they are, obviously, heavier than carrying a down quilt + a pad (like the Enlightened Equipment ones shown above). NEW for 2018: The Big Agnes Duster is their new bag made to grow WITH your kids so you don’t have to get a new bag every few years. WIN! It’s a synthetic bag, rated to 15 degrees F with lots of room to move and wiggle as needed in the shoulder area, while maintaining heat thanks to the adjustable height clips. It’s slightly wider than the Little Red or Wolverine, and works for kids aged ~2 – 10 in my opinion. The photos below show it in the three different lengths from shortest (with my 2 year old on top) to longest (which is what my 9 year old uses). For years and years, I have directed people to Kelty Woobie 30 when they were looking for a small bag. It used to be very short, lined with fleece and what we used for the littlest ones. However, two years ago, Kelty ditched the fleece and lengthened their bag by quite a bit. In photo below, the purple/pink one is new and the green/blue one is the old style. When I inquired about the changes, they said they wanted a bag that kids could grow into more. They mentioned that you can throw in some clothing or cinch up the bottom of the bag for the little ones if needed (it’s all about them not having to heat up a ton of air space in their bags). Truthfully, we really miss that small bag, but they do have a point. People don’t want to buy a bag that lasts for a couple years at most. ADDED for 2018: Big Agnes Duster (see info in the above section). You’ll notice in photos below that the Big Dipper 30 is the same length as the Woobie when it is zipped to it’s smaller setting. Besides the Deuter bags, this is the only other one that adjusts length. You do have the extra bulk in the Big Dipper 30 (for carrying, etc. ), which is a reason to choose the Woobie over the Big Dipper. 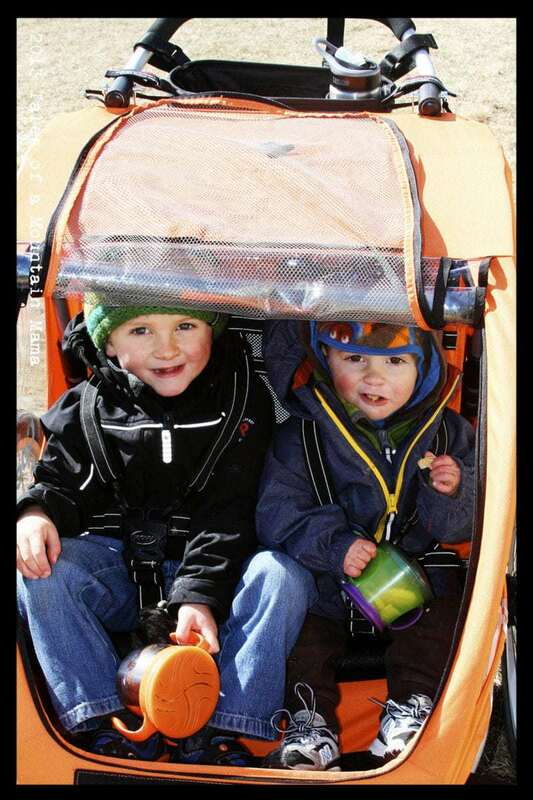 You’ll see that the Deuter Little Star is THE shortest kids’ bag out there when its zipped smaller. It’s also so ideal because the bottom can zip out and lengthen, which means you get a ton more use with it. 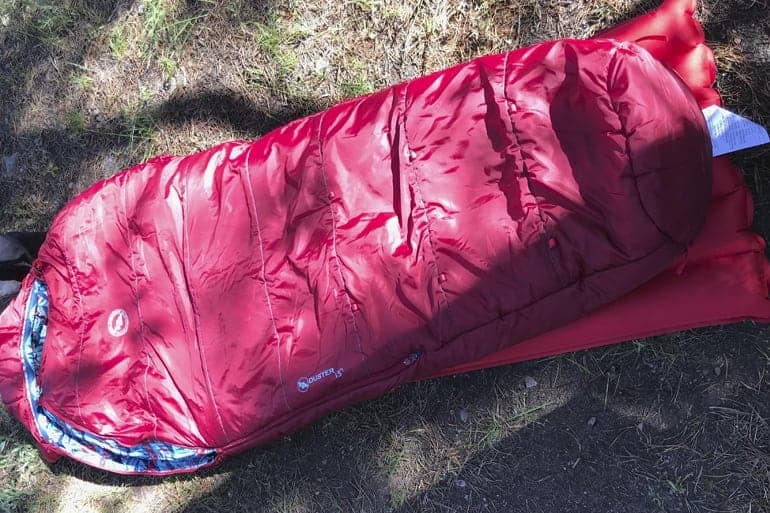 But, sorry, U.S. readers – the Deuter sleeping bags are no longer available here (but ARE for those of you reading in Europe!) 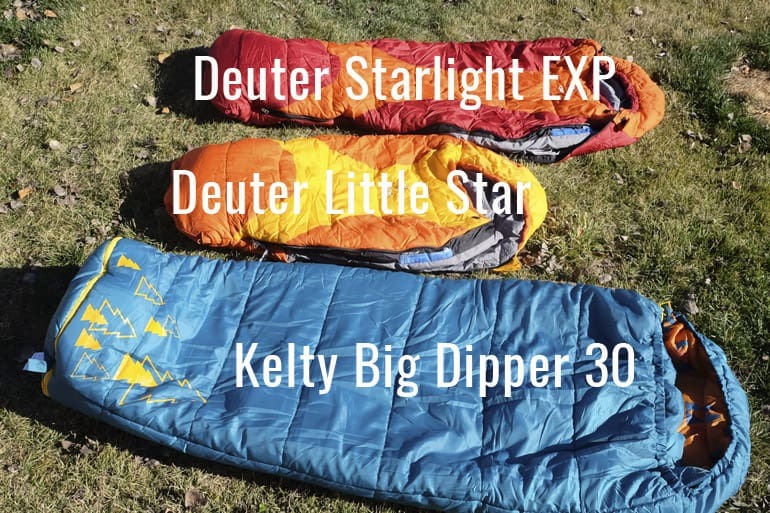 The Deuter bags (both the Little Star and Starlight EXP) are more of a summer weight, but really work for most conditions people are camping in regularly. 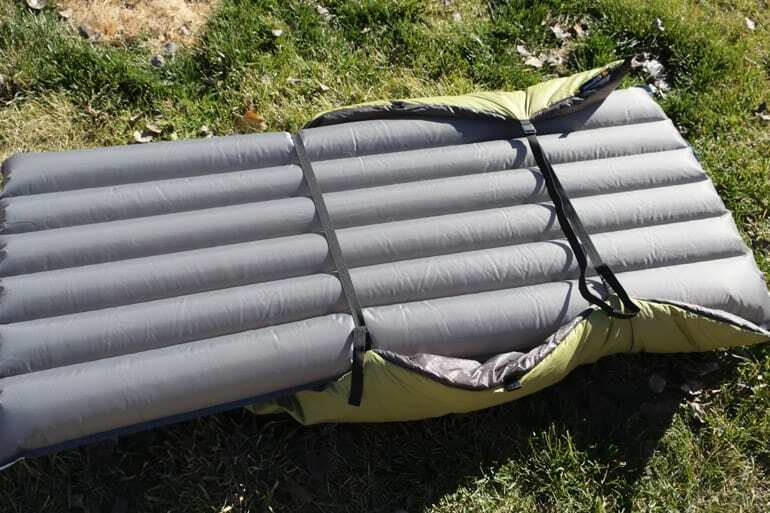 Big Agnes Duster and the Nemo Equipment Punk both have a pad-sleeve option AND are adjustable. You can see by this photo below that the smallest setting is about the same (notice the clips on the Duster lining up with the toggle on the Punk). The Duster has a slightly wider girth at the top that gets smaller closer to the toe-box. 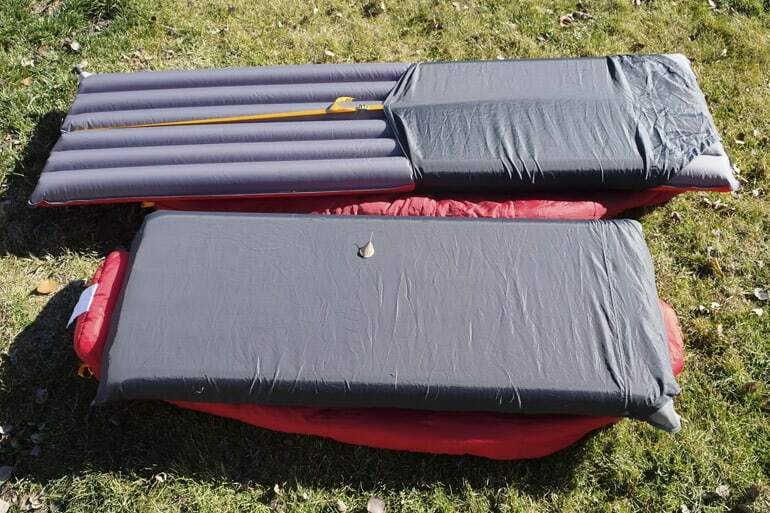 See photos in section #2 to see better how the Big Agnes adjusts. At a rating of 20 degrees F and a fleece-lined hood, this bag is another excellent choice to keep kids warm and grow with them. Sooooo….which one do I want? 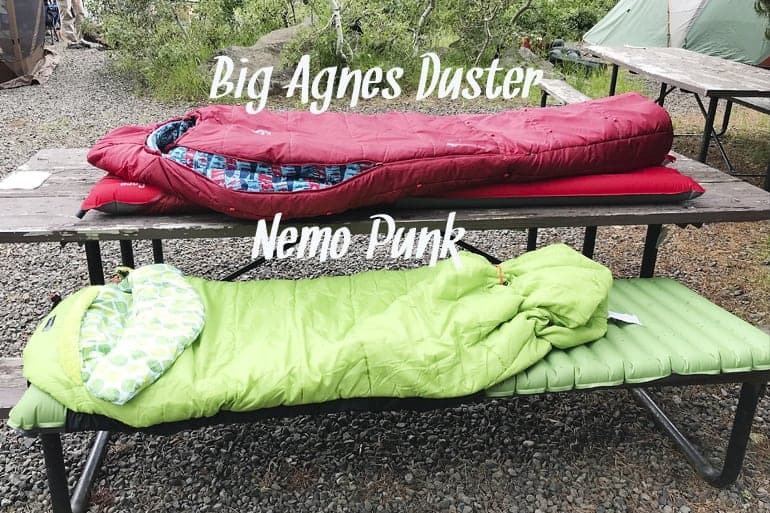 If your kids roll a lot, go with a Big Agnes Bag or a Nemo Punk. 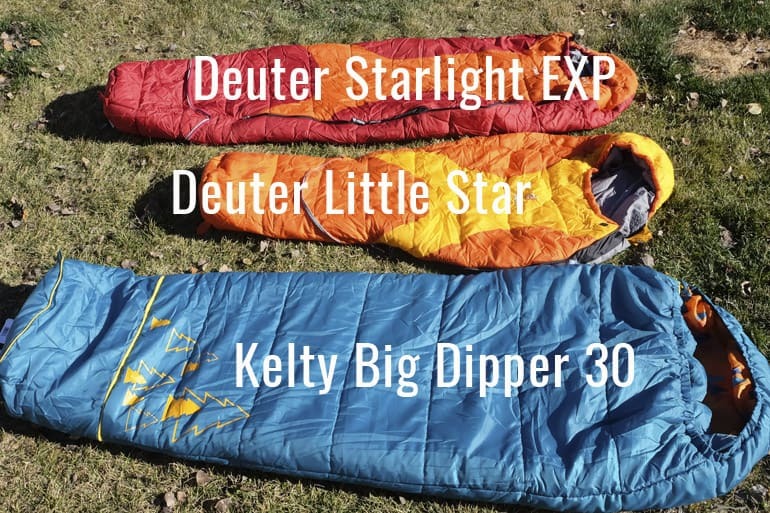 If you need more of a summer weight and want the sleeping bag to last longer as they grow, go with the Kelty Big Dipper, Nemo Punk or Big Agnes Duster. 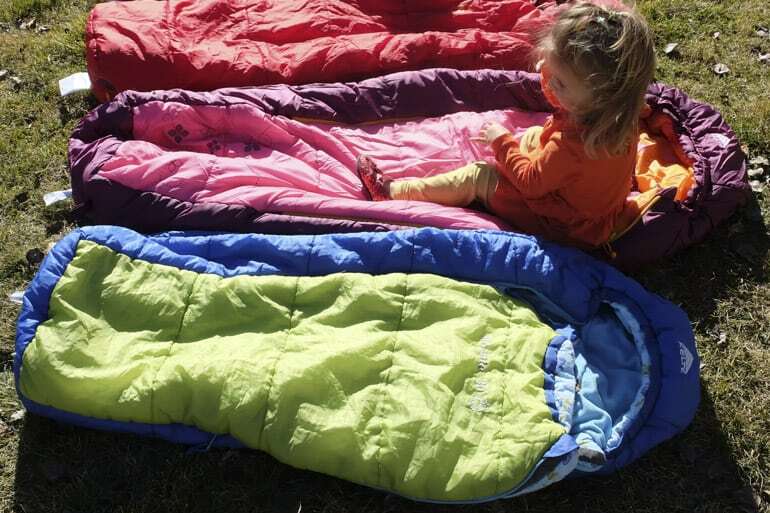 Because they’re rated for colder temperates, grow with the child AND have the pad sleeve, we choose the Big Agnes Duster or Nemo Punk for our kids. © 2016, 2018 Tales of a Mountain Mama. All rights reserved. Republication, in part or entirety, requires a link back to this original post and permission from the author. My mom JUST purchased our youngest a bag for Christmas so… I wish this was posted a week ago 😉 I really like the idea of the pad sleeve in the Big Agnes and might just have to return the one we purchased (from LLBean) to look into this (or the Kelty Try.Comfort!)…. THANK YOU. Loved this post. Based on your review we got a Nemo Punk for our two year old. 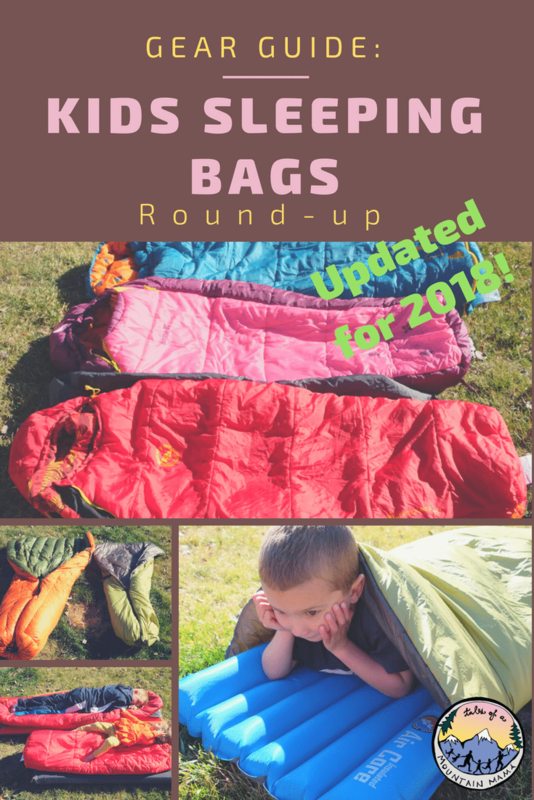 (I also got the Nemo pad) Finished our first camping trip with said two he old and we love this bag The integrated sleep pad sleeve is a MUST for a wriggly toddler that I would have never thought to have looked for! 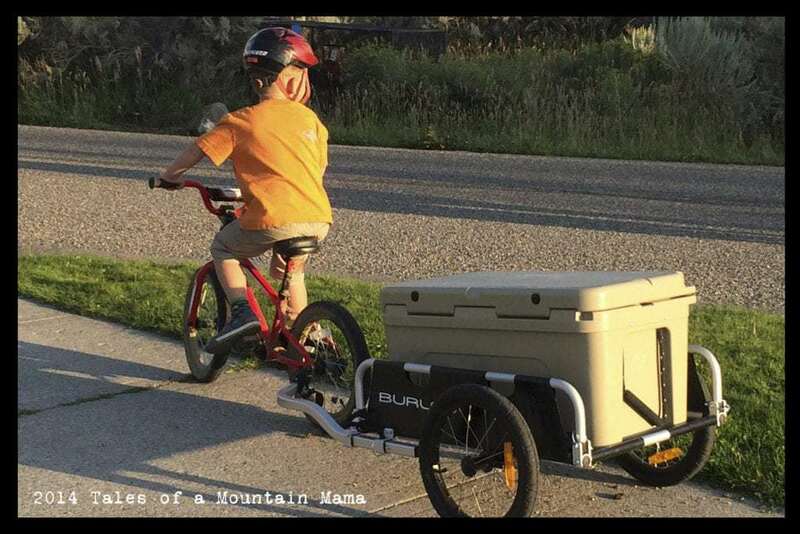 It’s a good weight for summer camping in the CO Rockies. Our trip was unusually warm but I’m confident it will be warm enough for much colder nights sure to come. Also like the boxy (not mummy) shape. My son sleeps like a starfish at home and did not complain or “break loose” in the night. Thanks for posting this review! So glad it worked great for him!